Organizations behave as knowledge-seeking communities when their members share beliefs about cause-and-effect relationships, norms for evaluating information, and values that guide the translation of knowledge to practice. What are the practices, arrangements, and mechanisms that make up how an organization knows what it knows? What are the underlying values and norms that shape the character and orientation of these methods? What can we learn from failures and disasters in organizational learning - and how do organizations become susceptible to common learning traps such as the self-fulfilling prophecy, groupthink, group polarization, learning myopia, and selective information processing? 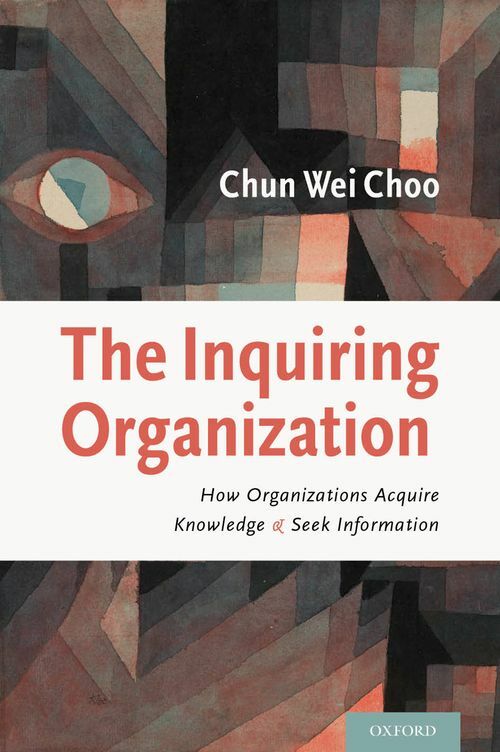 In The Inquiring Organization, Chun Wei Choo examines how an organization's knowledge-acquisition and information-seeking leads to the construction of beliefs and the formation of epistemic practices that can affect its capacity to learn and grow. The book explores the epistemology of organizational learning and information seeking; how organizations acquire and justify knowledge; and how information is sought and shaped to warrant as well as to question beliefs. It starts from the premise that organizations are truth-seeking - they seek beliefs which are well supported by reasoning, evidence, and experience in order to act more effectively. It then makes the case for a normative view of organizational knowledge which identifies the epistemic norms that an organization needs to pursue in order to acquire valid knowledge and true belief. The book progressively develops a set of information and epistemic features that are used to describe an inquiring organization. An inquiring organization is one that is motivated to acquire knowledge, where this motivation for knowledge includes not only the pursuit of truth, but also understanding, creativity, and curiosity. It has developed norms and practices of information seeking and knowledge acquisition that are truth-conducive, granting it reliable success in acquiring knowledge that is advantageous to the organization. It sees knowledge as the result of an ongoing process of inquiry in which knowledge is always provisional and always being improved upon, where beliefs are linked to experience, and the seeking of knowledge is an inclusive, collective enterprise. Chun Wei Choo is Professor of the Faculty of Information at the University of Toronto. His recent books include The Knowing Organization (OUP, 2nd ed., 2006), The Strategic Management of Intellectual Capital and Organizational Knowledge (OUP, 2002), Information Management for the Intelligent Organization (3rd ed., 2001), and Web Work: Information Seeking and Knowledge Work on the World Wide Web (2000).